You can change the domain name of your Managed WordPress account. If the domain you want to use is in use by another hosting account, you need to remove it from that account first. You might also need to remove any subdomains of your primary domain name before you can change it (Web & Classic / cPanel / Plesk / Managed WordPress). If you have an SSL certificate applied to your hosting account, you will need to revoke it before you can change your primary hosted domain. For more information, see Revoke a certificate. You can find details about what we do to your Managed WordPress account when you change the domain name in What happens when I change my domain? For the website you want to change, click the three-dot icon and select Change Domain. Add or Remove "www" Next to your domain name, click the three-dot icon and select the option you want from the list. Use a different domain Click Add Domain. Then select or enter the domain you want to use, select Make this the primary domain for your account, and then click Add. Note: It can take up to 24-48 hours for any DNS changes to take effect. After changing the domain name, you might want to update the domain name's DNS settings. You can locate those in View my IP address. 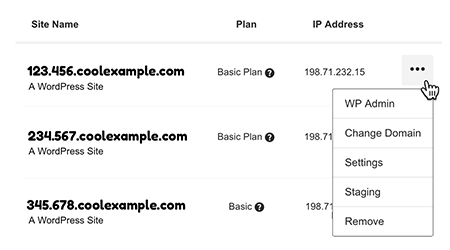 If you manually enter a domain that is not in your GoDaddy account, you will need to update the A record for that domain to point it to your Managed WordPress IP Address.